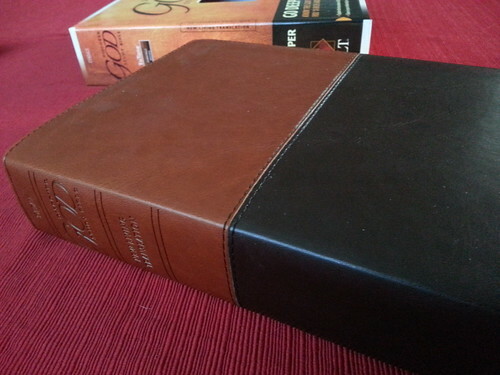 My go-to Bible is a New International Version, the binding still strong after many years use. The inside page still identifies its owner as Sherry Carlson. With all the available translations I wondered if it might be time to trade in “old faithful” with all its notes and highlighted verses for a fresher version. 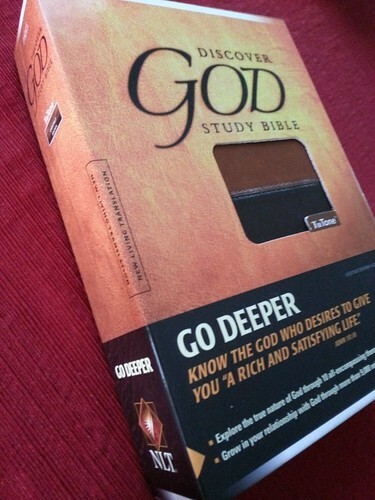 Last weekend I was talking to my friend Nita about what translation of the Bible she reads. She listed a few good reasons for choosing the New Living Translation. When I came home I contacted Craig, my favorite Bible scholar (pastor/teacher) for his opinion. “It gets decent marks for accuracy but takes a ‘dynamic equivalent’ approach instead of a more literal approach. In the former the goal is to evoke the same response in the reader that the original words would have to those readers. So in some passages you’re not going to get the original wording; it might be something very different that gives the same sense. AKA a “thought-for-thought translation instead of ‘word-for-word. '” He’s thorough, as you can see. That was enough research for me. So I moved to the shopping phase. Looked at Amazon, looked at Zondervan, then thought to look at the Bible section of our own bookshelf. I pulled this out from among twenty-plus choices. Still in its box. Brand new, beautifully bound. A gift from my brother, John. 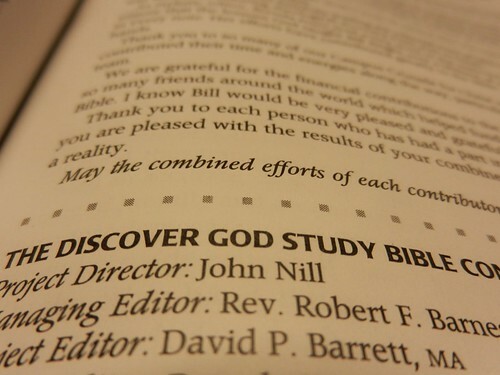 He was the project director for this study Bible. I am pathetic—and giddy. This entry was posted in in the neighborhood, old friends. Bookmark the permalink. How cool is that! Makes me smile. God bless you, dear friend. Enjoy your Bible. I’m enjoying reading it through in this translation.